The sixth edition of the Hands-on Agile series takes a close look at Product Owners and some anti-patterns they may be employing. 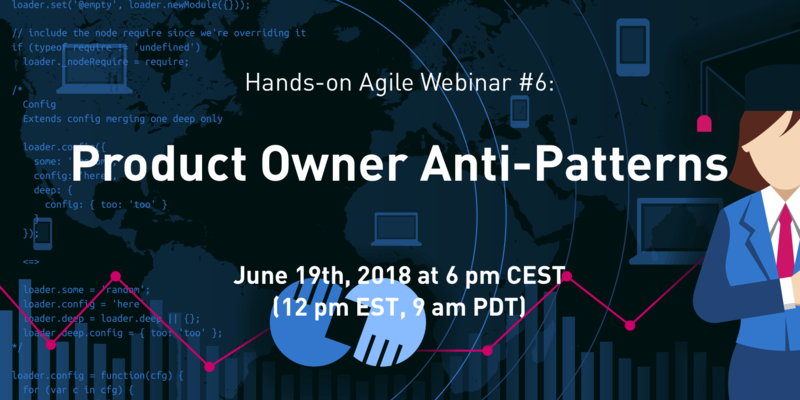 The sixth Hands-on Agile webinar addresses Product Owner anti-patterns, providing 12 ways to improve a Product Owner’s skill set. Learn also when you — as the Scrum master or Scrum team — should reach out to your Product Owner and offer support. Note: If the browser will not play the videos, click here to watch them. The second episode covers creating the product backlog in the wrong way: The Product Owner treats product backlog items not as a token for discussion to build a shared understanding of the why, how, and what with the team, but as deliverables. Often, the PO creates product backlog items upfront by copying from requirement documents without including other members of the Scrum team. The Third episode covers the weak Product Owner: The PO has not learned to say no to stakeholders demanding new requests. Trying to being everybody’s darling creates mediocre products that do not scale, though. It also defies the Product Owner’s most important duty: protecting the product backlog from tasks with little or no value. The seventh episode covers the pushy PO: The Product Owner pushes the development team to take on more tasks than it could realistically handle. Probably, the Product Owner is referring to former team metrics such as velocity to support his or her desire. The Agile Transition – A Hands-on Guide from the Trenches e-book is a 212-page collection of articles I have been writing since October 2015. They detail the necessary steps to transition an existing product delivery organization of over 40 people strong to Agile practices.